ROSEAU - Commonwealth Secretary-General Patricia Scotland has promised to ramp up advocacy for the reform of development assistance rules which member states say are restricting aid to storm ravished countries in the Caribbean. She made the commitment at meetings with leaders in Antigua and Barbuda and Dominica during visits to the countries to discuss Commonwealth support after hurricanes Irma and Maria caused widespread devastation. “I promised to do everything in my power to challenge rules that say a high-income but climate vulnerable country that has just lost all its economic sectors and its entire GDP to a hurricane, is ineligible for Official Development Assistance. We have already seen progress on this after the UK intervened, with donor countries now committing to review the rules,” Scotland said. She added that the Commonwealth is also supporting Antigua and Barbuda and Dominica through initiatives such as the Climate Finance Access Hub. 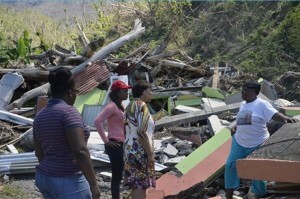 “We already have an expert on the ground in Antigua and Barbuda and we are working with Dominica to get someone in as soon as possible to help create strong climate change projects which will attract funding,” the Secretary-General said, adding that the organization is helping to strengthen legal frameworks to meet mitigation and adaption goals and ensure smooth relief efforts after hurricanes of this magnitude. Recalling her arrival in the hurricane-ravaged islands, Scotland said nothing could have prepared her for what she saw or the stories she heard during my visits. Despite the tragedy and unimaginable devastation, the Commonwealth Secretary-General said she saw in Antigua and Barbuda and Dominica an unbreakable spirit of resilience and revival. “These countries declared loudly ‘we are still standing and we will continue to rise up from this disaster’. But they need help,” she said as she appealed to the international community. Photo: Commonwealth Secretary-General visits with hurricane affected.